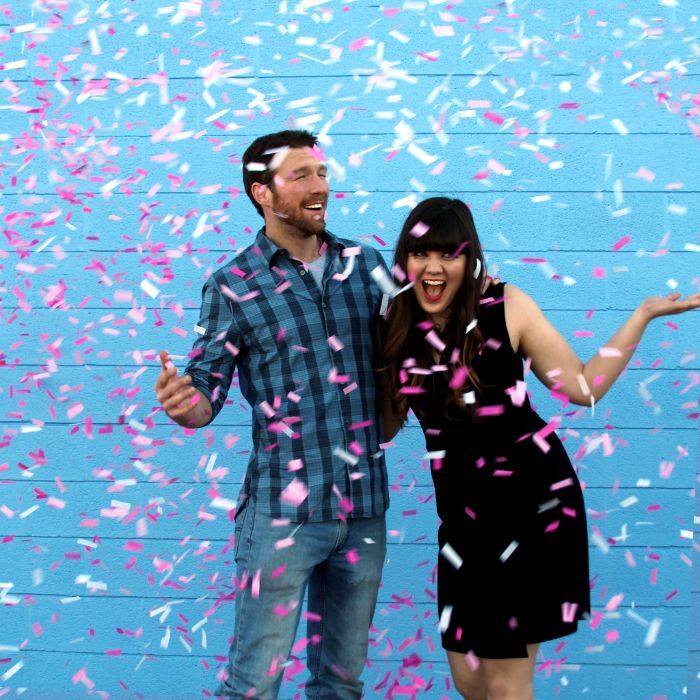 Color Blaze has all kinds of great gender reveal party ideas for your next event. Gender reveal parties are becoming a creative way to celebrate with family and friends when announcing your baby’s gender. Hosting one can be so much fun and a special opportunity to share with those closest to you. 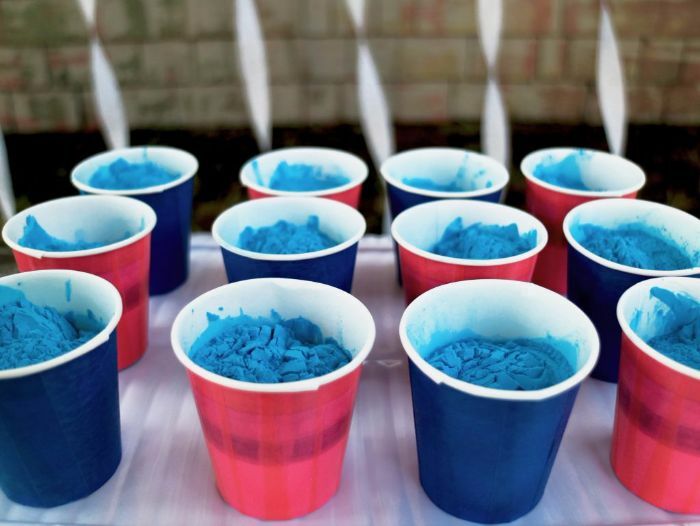 There are all kinds of gender reveal party ideas for you to explore – Color Blaze is thrilled to provide you with some of our favorite gender reveal party ideas using color powder. A color powder toss is one of our favorite gender reveal party ideas because it involves everyone! Depending on your needs, whether pink or blue powder, you can ask your guests to wear white – you may want to warn them that they are going to be covered in blue or pink colored powders! 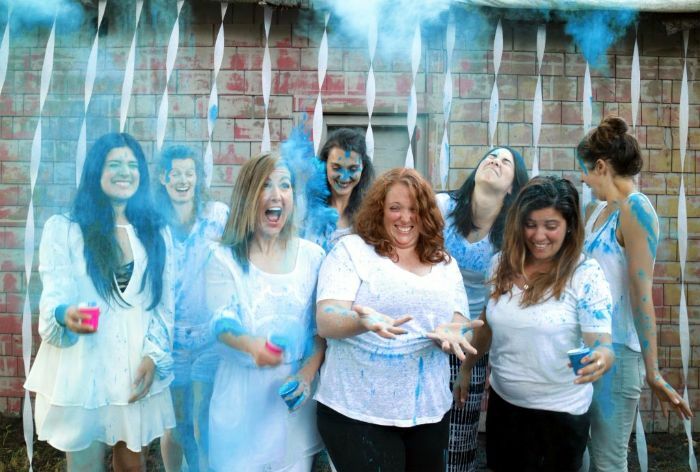 Please join us (and our bun in the oven) for a Gender Reveal Color Powder Party! Please wear casual white clothing. 100% cotton is suggested for easy washing- you are going to get covered in Pink or Blue! 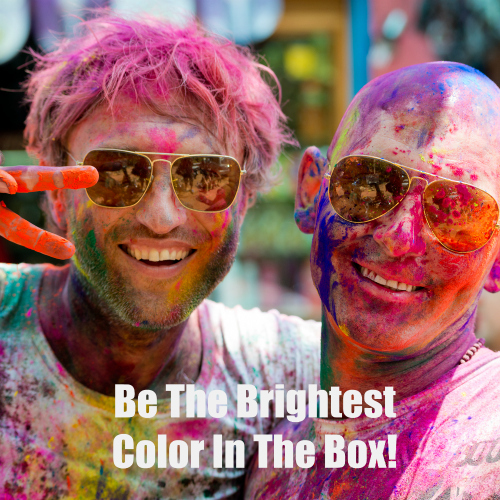 Depending on the size of your party you may want to order Color Powder Packets – 1 packet per guest should suffice. 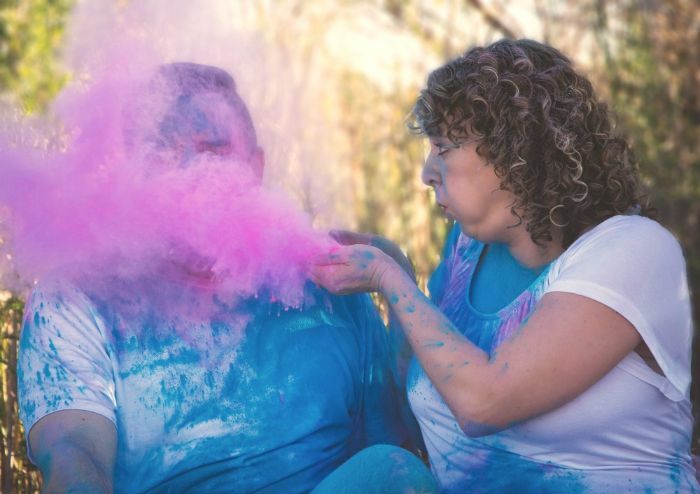 (you will need about ½ cup of powder per person) If you are having more than 25 people you may want to consider ordering a gender reveal package with 10lbs of colored powder it may be more cost effective for you. To dispense the powder you can either hand the packets directly to your guests – however keep in mind that the packets are clear and they will see the color. You can also purchase small dixie cups (the bathroom size.) If you are crafty you can decorate the cups with fun washi tapes in pink and blue patterns. When you are done – carefully scoop up some powder with one of your extra cups and slowly, carefully pour it into your decorated cup. You can also use a spoon and spoon it into the cup. If you want to conceal the color, you may want to put a strip of pink, blue or white duck tape across the top of each cup to seal it. P.S. – if you want to be surprised right along with your guests, ask a trusted friend to order the powder and prepare it for the party. 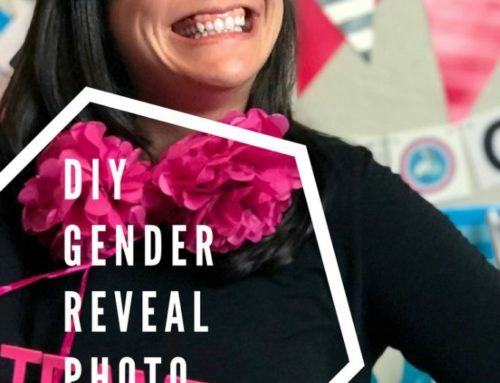 When you are ready to reveal the gender, count to three and have your guests rip off the tape and throw the contents of their cups in the air! You will have a bright pink or blue cloud and everyone will have traces of pink or blue powder on them. And remember, colored powders are awesome fun that should be kept outside. It is a great activity for in the yard and as easy to clean up as sidewalk chalk. So do your best to plan your event on a warm sunny day, because taking this party inside is not advised. 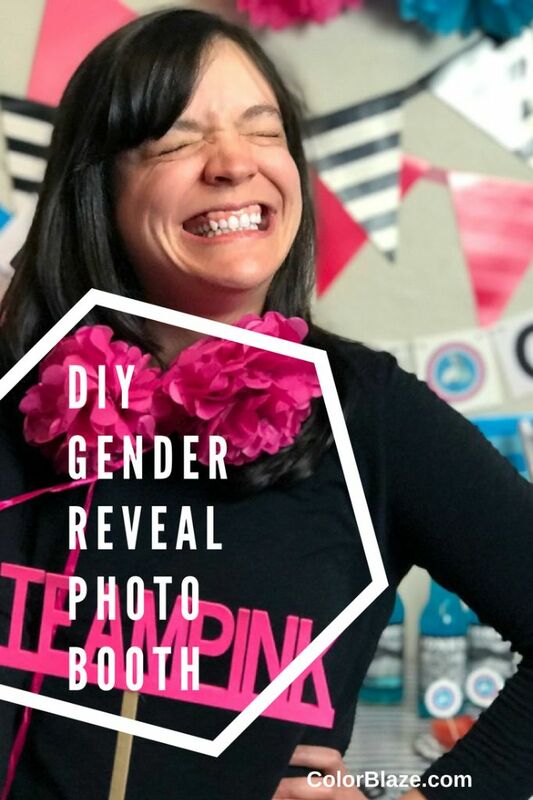 Most importantly make sure you have a photographer standing by to capture every moment of this unique gender reveal! Many expectant couples choose to stage a cute photo shoot as a unique way to reveal the gender of their baby. They create a photo that shows whether the baby is a boy or a girl or both (twins!) and post it on social media. You may want to hire a professional photographer to capture beautiful photos that you will forever have as keepsakes of your pregnancy. Color Blaze Color Powder is a great option for a gender reveal photo shoot. You can create the photo much the same way as our Color Powder Toss! You may want the photo to be just the two of you, but if you have older children we suggest involving them as this is a fun, messy activity that kids love! Have everyone involved in your photo dress in white. Order yours in the appropriate shade and then let the games begin! We suggest having an all out color powder fight! Everyone will have a great time throwing pink or blue on each other with lots of smiles and laughter while your photographer snaps away. Once everyone is covered you can pose for your final shot! At this point everyone should be pretty well covered in pink or blue and your snapshot will clearly show whether your bun in the oven is a boy or girl! Boy? Girl? Pop to See! Another gender reveal party idea is a Gender Reveal Ballon. A Gender Reveal Balloon reveal is super simple, easy to clean up and doesn’t require any special crafting skills. The Color Blaze gender reveal balloon comes with pink and/or blue confetti. If you like you can opt to add colored powder to the balloon instead. One or two individual packages of colored powders should be enough. Remember you don’t want too much weight in your balloon if you are filling it with helium as the weight may keep it from floating. 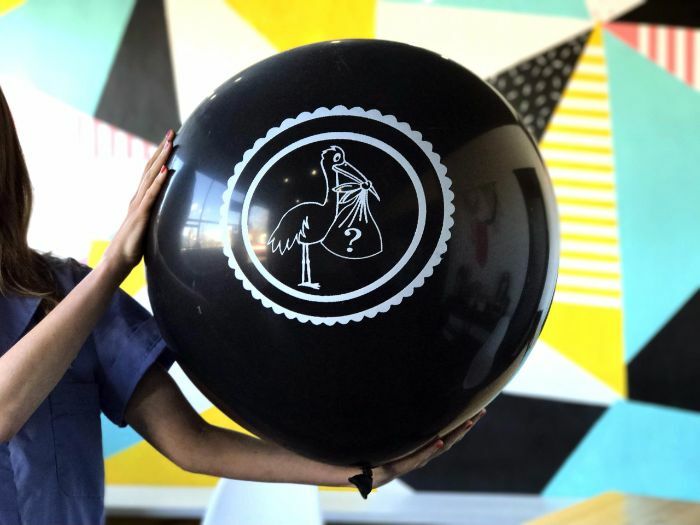 The Gender Reveal Balloon kit includes a giant opaque black balloon and a packet of perfectly portioned confetti! You can place the confetti inside the balloon by using a toilet paper roll hack as an easy fill assist! Once you add the confetti or color powder just visit a local party store to add helium (most shops charge between $5-$7 to fill balloons of this size). These giant balloons must be completely inflated to support the weight of the confetti and still float. Make sure the balloon shop tests it before you leave. If it hovers low when fully filled, just shake it about to distribute the confetti or powder evenly inside. The next step is to gather your family and friends and POP to see! Let Pink or Blue Confetti Rain Down on You! Color Blaze also offers confetti sticks as a fun alternative to a color powder reveal! They are so much fun and super easy to use. Each 14″ confetti stick is filled with either pink or blue confetti, but white confetti is placed at each end so you can’t guess the gender until you flick the confetti stick and it release the confetti. Just gather your guests around you and hand everyone a confetti stick. Have them hold the confetti stick up and out in front of them and give it a hard flick – like you are flicking a magic wand! Then the real MAGIC happens as you are showered with Pink or Blue confetti. 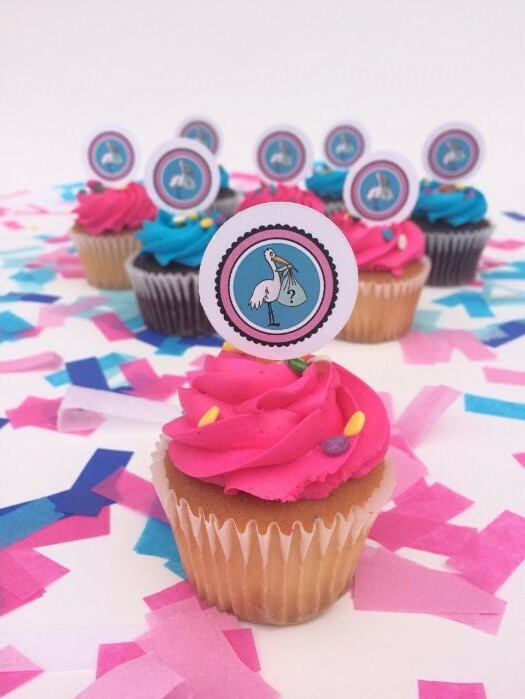 Pinterest is abound with all kinds of pink and blue snacks for gender reveal parties. Pink and blue rice krispy treats, Oreos dipped in pink or blue frosting, pink and blue cupcakes, pink and blue sugar cookies – you get the general idea! COCKTAILS AND MOCKTAILS are also fun! You of course want to stay with the pink and blue theme. You can offer boozy sips including sparkling rose and champagne and garnish with strawberries and blueberries. Mocktails can include Jones Berry Lemonade Soda in blue and just good old fashioned pink lemonade. Serve it in a fancy glass to add to the celebratory atmosphere! Themes – there are so many fun themes out there you can choose to go with – Footballs or Pom Poms, Touchdowns or Tutus, Prince or Princess, Stashes or Lashes etc. If there isn’t a theme that tickles you, go with pink and blue! It is easy to decorate for and it definitely captures the focus of the day! Color Blaze has a wide variety of gender reveal party supplies for every theme! Visit our last post for more information on the many ways to use colored powder for fundraising events!